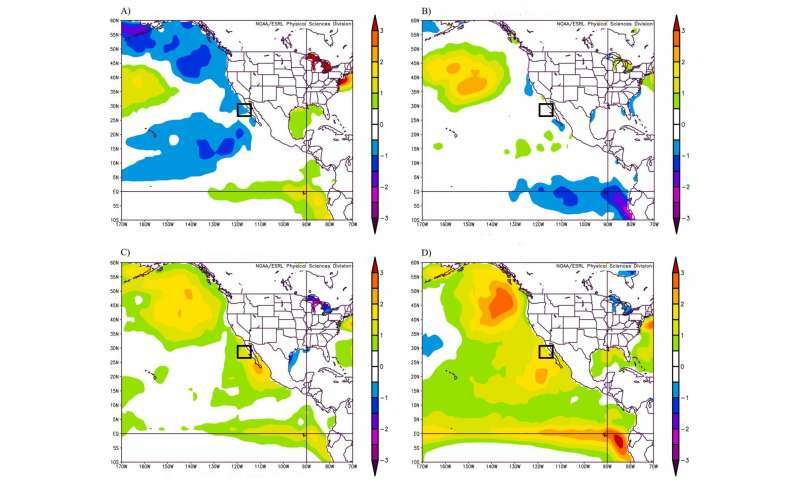 During 2014 and 2015, sea surface temperatures on the Pacific Coast of North America were 2 to 5 ?C higher than normal. High sea surface temperatures decrease primary productivity and ultimately the availability of prey for marine mammals. California sea lions are likely to be particularly vulnerable to prey declines because they typically forage within 100 kilometers of their breeding sites. Prey declines could force them to extend foraging trips and eat lower value prey, which could affect pregnant and lactating females as well as pups. Acevedo-Whitehouse and colleagues compared the body condition and immune competence of 61 California sea lion pups born on during 2014 and 2015, when sea surface temperatures were high, to those 23 pups born during 2013, when sea surface temperatures were normal. Data included blood levels of glucose, a marker of malnutrition, and IgG and IgA immunoglobulins, two different types of antibodies. In addition, the researchers tested pup responses to an immune challenge: injections of phytohemagglutinin, a plant-derived compound that stimulates division of immune system cells called T lymphocytes. The researchers found that blood glucose was 15% lower in pups born when sea surface temperatures were high, suggesting that they were in early stages of starvation. These pups also had markedly lower levels of two immunoglobulins and were unable to respond to the immune challenge. This work suggests that atypical climatic conditions may limit energetic reserves and compromise the immune response in California sea lion pups, and could potentially leading to high death rates. Moreover, say the researchers, the entire northeastern Pacific ecosystem could likewise be vulnerable to high sea surface temperatures. "Low Lunar gravitational influence may limit the reproductive rates of the N. African Swallow".